Eight Different Display Sizes from 6" to 15"
The EZP PLC Series has been discontinued. Please see the OCS XL Series as a possible alternative or contact our Automation Engineering department. EZTouchPLC is the most sensible combination of PLC and HMI in one highly integrated package. It utilizes EZPLC’s base (built in) and thus capable of all the features present in our EZPLC and uses our ‘Mix-n-Match’ EZIO modules (sold seperately) to deliver a truly modular integrated system. EZTouchPLC can be used as a total control for a small to medium machine that requires a touch type graphical display. 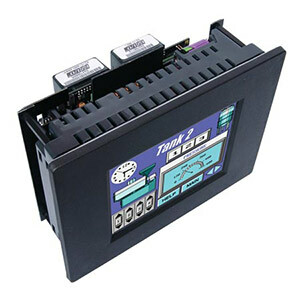 It eliminates the need to buy and install a PLC and Operator Interface separately and thus reduces the electrical panel space, making the control system extremely compact and cost effective. Wiring Duct for Routing Field Wires Every EZI/O module has a wiring duct for routing field wiring in neat bundles. EZI/O modules come with male headers to accommodate 11 point removable Phoenix terminal blocks (UL rated for 300V 10 amp 14 AWG) for ease of wiring.